I’m shocked that the end of September is right around the corner. I typically work on this post throughout the month, but I woke up this morning and looked at the calendar to realize that we have just three days left of the month! Where did the time go?! The month always breezes past for me because it’s my busiest season at work, which unfortunately leaves me with little time to work on the blog. I wish I had more time for it, but I need to focus my attention on the job that actually pays my bills! No matter how busy I was, you know I found time to add a few new pieces to my wardrobe. Before we get started, we need to make sure you’re in the know about the latest Shopbop sale. You can save 20% on orders under $500 and 25% on orders over that amount. Use code EOTS17. If you’re an Amazon Prime member, remember that you also get free two-day shipping. Another great sale worth checking out is at Bauble Bar where you can save 25% off your order with code BIGONE. Hurry, though, that sale ends tonight! See all of this year’s sartorial purchases here. Madewell ‘Elinor’ loafers in chestnut: These are fantastic quality and they’re comfortable right out of the box! They run true to size. They’re also available in black and white. Caslon bell-sleeve top in purple (worn here): Unfortunately this is already sold out. If it does pop back, you’ll need to go down a size. The top is adorable with jeans for those nothing-to-wear days. LOFT ‘Royal Floral’ shirtdress (worn here): I almost didn’t buy this dress because it looked so drab online. However, the cut is one I typically wear on repeat, so I gave it a whirl. And, I’m so happy I did! I absolutely love this dress for fall. It’s short and loose, which makes it adorable with flats. 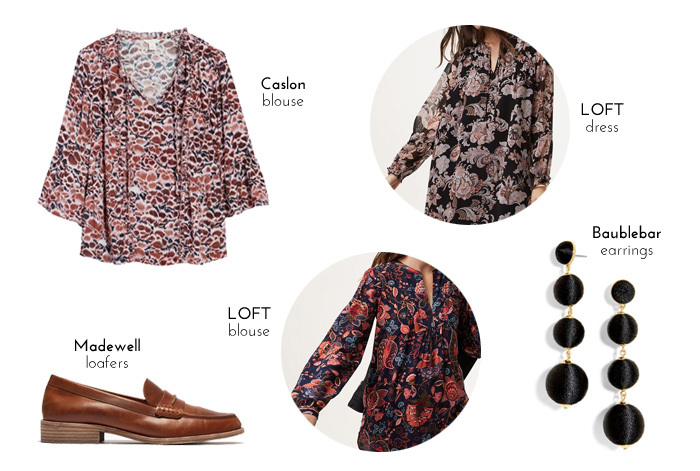 LOFT ‘Hydrangea Bouquet’ tunic: The fabric of this shirt is an amazing quality for the price point. It feels thick and silky, and the colors are vibrant. It’s a great option for fall to wear over slim jeans or tuck into a flared pair. Go with your typical LOFT size. H&M jacquard-patterned dress: I’m still a little bummed that this didn’t work out for me! The monkey pattern is so ridiculous, but in a really good way. However, the fit was awful. The shoulders were too wide (even though the bottom of the dress fit correctly), it was entirely too long and would have needed to be hemmed above the knee, and the bow was too overwhelming on my frame. Good attempt; just poorly executed. The items I just might add to my wardrobe next month. This plaid coat for fall. A suede dress to wear over blouses. I love it in olive.